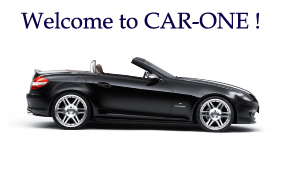 Hello, and welcome to CAR-ONE ! Since 1987, our company has been specialized in the retailing of new and used Mercedes vehicles. We permanently have 50 vehicles available from stock, representing the entire range all the latest Mercedes models on the market. All of the vehicles we offer you are available from stock, furthermore, thanks to our daily contacts all over Europe, we also manage a virtual stock of +/- 1000 vehicles. So if you didn’t find your dream car right away, we are able to find it within a couple of days. We are ideally located in Brussels (Evere) at the doorsteps of Mercedes Benz Belgium, near Brussels’s International Airport (5 km) and at 8 km of Brussels’s Midi train station. All of our vehicles are debivered with a full 12 months European warranty , have never been damaged and full check-ups and services are done before every single delivery. We also take care of temporary registrations, customs documents, and shipping all over the world. Our team of family members will offer you a great and personalized service.